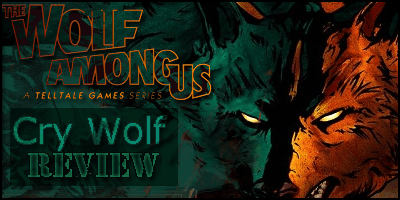 Cry Wolf sees The Wolf Among Us come to an end. But will the finale see Bigby bring the Fabletown killer to justice or will things just end abruptly, leaving many questions unanswered? As always, you’ll have wanted to play through the previous four chapters of The Wolf Among Us before you even start thinking about taking a look at Cry Wolf. Additionally, our reviews try to be as spoiler free as possible so if you’re worried that reading through this will ruin the rather excellent Fabletown story, then fear not! After a great start, the last couple of episodes of The Wolf have seen both Bigby Wolf’s and the gamers enthusiasm drain away a little. The last time we experienced the Fables, we couldn’t help but get distracted as the mid-season fillers became slightly tiresome with Episode 4: In Sheep’s Clothing really hitting some low points. That said, we fully expected Cry Wolf to end the series on a high and that’s exactly what we have here…. The Wolf Among Us Episode 5: Cry Wolf is excellent! Putting to one side the still slightly tedious long loading times that have hit the entire Telltale Games series, Cry Wolf sees a return to the atmospheric, dark, emotional but compelling story that started way back with Episode 1: Faith. Bigby has been getting angrier as the season has progressed but nothing will prepare you for just how irate the Fabletown Sheriff becomes in this latest tale. Starting off in the volatile den of The Crooked Man, Bigby soon comes to blows with near enough everyone he has met since the death of Faith. Whether they’ve helped or hindered him in the past now makes no difference as justice needs to be sought and Bigby, along with the increasingly proactive Snow White, fight for what is right. 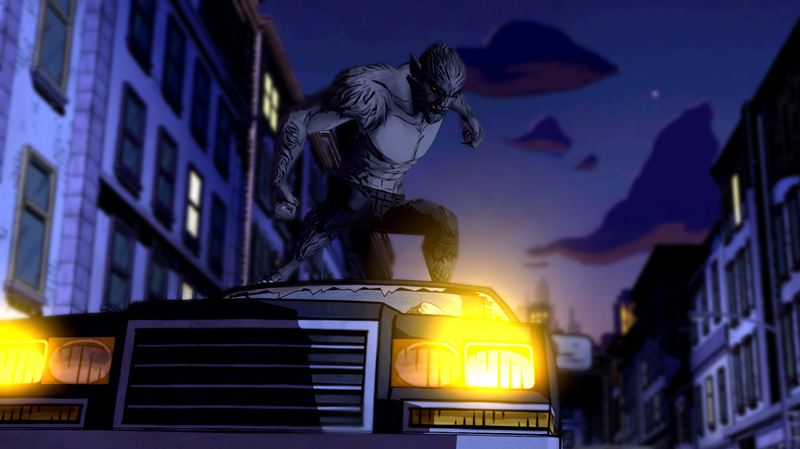 Cry Wolf sees a massive return of the famed Telltale quick time events and for once, there’s not a hint of lag to be seen as Bigby evades attacks, dodges vehicles and scales the rooftops of the city in his quest to take down The Crooked Man. The sheer amount of QTE’s involved means there’s absolutely no room for the boredom that afflicted the previous chapter to hit home but in the same breath there’s now very little of the investigative work we previously loved on offer as much of what you need to know is played out in front of you via quick time events or through the deep conversation trees. If you like interrogation though, you’ll be more than happy with how Bigby conducts himself with Georgie Porgie, BlueBeard and co as you revisit near enough all the old haunts that helped set the scene in the first place. And be sure to go down those conversational routes as far as you possibly can as at the end you’ll find a side of the wolf that you’ve never seen before….and possibly never want to see again! 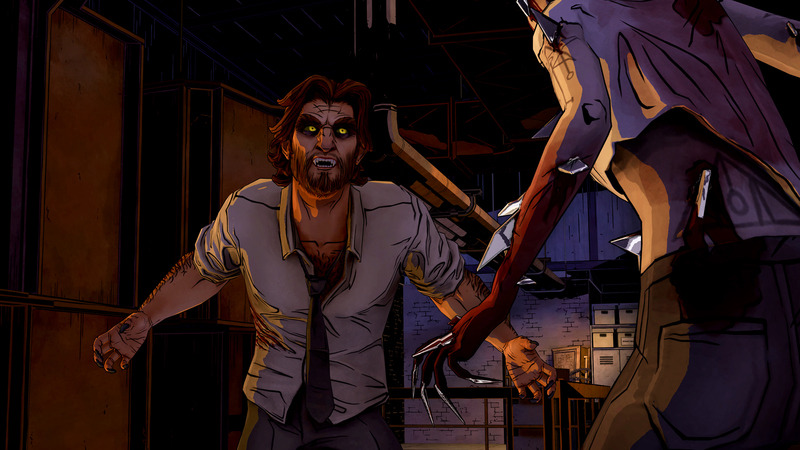 The Wolf Among Us Episode 5: Cry Wolf is exactly what the series needed. After a brilliant season opener, things have been heading on a downward spiral for the last few months, but Telltale has kicked all that into the past and delivered one of the best written and well voiced, albeit short, episodes I’ve had the pleasure of experiencing. Many questions get answered but as with all good stories, there’s enough scope left to see Bigby, Snow and even Toad come back for future tellings if need be. He huffed and he puffed, and my god Bigby Wolf has blown that damn house down. Previous articleFIFA Ultimate Team Team of the Tournament detailed!